There’s the two-story, wood frame home next door of Great-uncle Edward, who ran the mill later. I’m told that there may even be some boards and timbers left from the millhouse and family barn, which was handed down to my Grandfather Wesley, scattered throughout the park in various pavilions and shelters. We haven’t, however, been able to trace the whereabouts of the giant stones used in the early milling operation. Nor do we know if the mill switched to rollers, which were introduced from Europe around 1876. 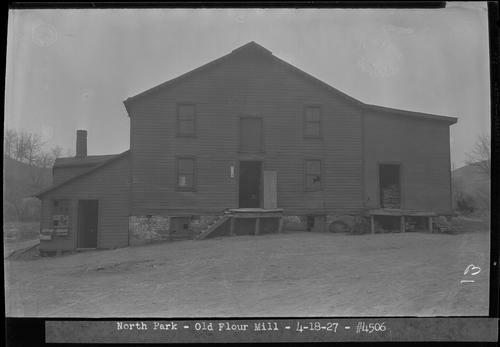 My late father, Ralph, said that the County didn’t think the mill was worth saving, in light of all the other construction to be done in the new park in 1927. Oh, that some group had saved those stones or rollers and put them on display as they did after the destruction of Great-uncle Edwin Pearce’s Shreve, Ohio, mill. Those stones can still be seen at the Wayne County Historical Society and Museum in Wooster [Unfortunately, the Society has the picture of the stone labeled incorrectly on the Internet as an outdoor bake oven, but to see it go to HTTP://WAYNEHISTORICALOHIO.ORG. Having looked at that stone and its mill site, having talked to North Park officials and Western Pennsylvania historians, and having studied several 19th century mills within a few miles of my house in Somerset and Westmoreland Counties, I wish to speculate on the operation, both mechanical and business, of the old Pearce Mill as a way of possibly gaining some additional understanding of the life and times of our family. I must admit that before I studied the milling process I believed that the Pearces simply dumped the grain from sacks onto the stones and caught the meal or flour back in the sacks as it came out from between the stones. No wonder gristmills are such large buildings! But, Dedrick redeems me when he says that, “Formerly, the word ‘mill’ was used only in connection with the place or apparatus where the grain was ground. The miller was he who attended the mill and performed the duty of grinding” (13) “Mill” can now apply to any building where processing is done, paper, cotton, wool, steel, spice, etc., but the word “miller” has always referred to grinding grain into feed, meal, and flour. The first stage, the cleaning and preparation, may also include a drying process. The cleaning, then, can be of either the sieve or aspiration types, that is the whole grain “berries” can either be filtered away or the chaff can be blown away. In Bible times we read about cattle treading on the heads of grain on the threshing floor, then the mixture was thrown in the air to separate the wheat from the chaff. Later technology included a rolling screen or barrel with fan. The grain works its way through small holes while a fan blows away the chaff and impurities called dross or refuse. Even later technology was called a “smutter” because it was able to break up and blow away the dirt that attached itself to grain. Impure particles from this stage are often bagged as birdseed. Today, the grain headed for the millstone goes through a series of magnets to remove any metal particles than could damage the stones and end up in the final products. Dedrick shows various grain cleaning machines: a scouring case, an upright brush machine, and a washer and whizzer (where after being scrubbed in water the grain is separated by centrifugal force then dried with warm air). Like coffee, sometime grain is blended for a particular mix. Sometimes the pre-grinding stage calls for conditioning, in which case heat or steam is applied to soften the kernels. Humidity and moisture content are important factors in milling. After the cleaning and purification comes the grinding, and integral to this process is what’s known as “bolting.” This is simply the sifting process that separates the finely ground particles from the more coarsely ground ones. This is usually accomplished through the use of flat sieves, or sifters, not unlike the hand-operated flower sifter common in most kitchens until the advent of pre-sifted flours in the second half of the 20th century. As much as 20 percent of the heavier residual here is lifted by elevator back up to be reground and go through the bolting process again. So undoubtedly, as in Evans’ mill, the Pearce Mill also had a bolting or sifting component. The earliest sieves were probably horsehairs stretched in two directions over a wooden frame and shaken back and forth by hand to allow the finer flour and meal to settle through into a basket, hopper, or sack. Later a coarse cloth was used, perhaps from which our unit of fabric is taken. One source says that the French used linen while the early Britons used wool fibers. Before the American Revolution required all the metal that could be manufactured, colonial millers used fine wire. They then turned to Dutch fishing net makers to create a fine mesh for bolting cloth. The final stage in the process is technically called “middlings purification.” Dedrick likens this to how the human body selects that part of any food that can be digested. In a sense, each step in the cleaning and grinding process is purification. He says, “When a miller speaks of purification, he usually has in mind those machines used in the process of milling which treat certain sizes of the broken endosperm called semolina or middlings, eliminating what we are pleased to call impurities before the reduction of those middlings into flour” (186). Today, Americans are criticized for their love of white bread, made from flour that has been ground so fine as to remove any larger particles that might be beneficial in the digestive tract as bulk or fiber. The flour is even bleached to make it look purer. Fortunately, some of the vitamins are artificially put back in the flour before it’s made into bread. I’m sure the Pearce’s flour had all the ingredients of our Wonder Bread, only existing naturally. In the end, the bolting and purification process sends product into the following containers for bagging: finished flour; ready for baking; bran, which some like to use for cereal or add to bread flour, and middlings; which may be used for animal feed. Perhaps the nearest full-time stone manufacturer and dresser was back in Lancaster, almost 300 miles away. Richard would have had to keep his stones balanced and dressed all by himself. The stones, passing only 1/100th of an inch apart when turning, probably weighed anywhere from 1,000 pounds to a ton each. He would have needed lots of help lifting and moving them. Fortunately, the re-dressing may have been needed only every seven or eight years, according to information from St. Vincent. On the Western Pennsylvania frontier a miller’s tools of the trade and ability to generate an income were the difference between life and death for him and his family. Not counting his sister and brother-in-law’s family or the neighbors, Richard eventually had a dozen mouths to feed. Great-grandfather Charles, Richard’s successor, also had 12 in his family. The responsibility of these millers was enormous, but they persevered and prevailed. The water-driven system that made the gears go ‘round at Pearce’s must have been spectacular. We don’t know whether they used a simple “overshot wheel,” where the water runs out of the sluice or flume, dragging the giant wheel with it to the tune of eight pounds per gallon, or a “pitch-back wheel,” where the water is allowed to pass behind, dragging it contrary to the overshot. Other variations that the Pearces may have used include the “breast wheel,” where the water fills “kneed buckets” as it hits the wheel about halfway up with gravity pulling them down and turning the wheel, or the “undershot wheel,” where the fall is very slight, much like a paddle wheel boat. Water power is still used extensively in Switzerland through turbine technology. Dedrick gives many details and some interesting diagrams (451). Earlier, in part two of a story entitled “Settlement at Pine Creek,” we said that water power provided by the mill dam and mill race, was replaced by natural gas around the end of the 19th century. The Haymaker family of nearby Murraysville had discovered this wonderful substitute in spectacular fashion in 1878, and by 1916 the Pearce’s gas well was one of 150 in the immediate area. Buying power to run a mill can be the most expensive part of such an operation, but according to my late father Ralph, this gas was free and there was plenty left after powering the mill to heat several family dwellings on the property. Dedrick says that about 40% of mill power is used to turn the stones or rollers (298). As we close, let’s compare the Pearce operation with some contemporaries that I’m familiar with. Just south of Johnstown, Pennsylvania, known for her steel mills, a grist milling operation known as Thomas Mills, began in 1836. The land on which it stands was also depreciation property acquired by Alexander Thomas in 1802. His grandson, John, according to tradition, dug the millrace by hand, all by himself. The original stones, from Lancaster, Pennsylvania, weigh over 700 pounds and are on display in front of the still-thriving feed store and home center. While most of the original workings of the big mill are gone, 6th generation owner Dan Thomas still maintains a smaller, self-contained mill, which he displays at fairs and farm shows. All that remains of the Figge Mill along Circle Lake Road, even closer to my home, are the enormous hand-cut foundation stones and the handsome four-story, wood frame homestead, which once served as a stage coach stop on the Johnstown-Somerset Pike in the 1850s. A glance along the hillside to the right reveals the outline of the former millstream that diverted water from the Benscreek, now one of Somerset County’s most prized trout streams. Ironically, one of the finest examples of a gristmill that is still working today can be found only a few miles from the third site of the Pearce Woolen Mills in Latrobe, PA. [See “The Pearce Blanket.”] This delightful little town, made famous by native sons Arnold Palmer and Fred “Mr.” Rogers, welcomed our Lutheran Pearces in 1904 after their woolen mill had burned down in Greenville, Mercer County. But, a half century earlier, in 1846, a monk from Bavaria, Boniface Wimmer, had established a Benedictine monastery there to minister to the many German immigrants in that part of Western Pennsylvania. In addition to maintaining a church and farm, the self-sufficient brothers built a sawmill, brick factory, cider press, and gristmill. Most of the equipment was originally powered by coal fire, but the gristmill has been running on electricity for the last half century. Recently, the St. Vincent Archabbey obtained a grant to completely restore the mill inside and out. The museum and store is open seven days a week with products ground at the mill according to demand. Tours are available also (HTTP://BENEDICTINE.STVINCENT.EDU). My visit this week was thrilling, and not just because my favorite team, the Pittsburgh Steelers, had started training camp at St. Vincent College across the road. With the newly-produced historical video and the large window overlooking the on-going mill operations, I had a very realistic view back to the days when our Pearce Mill was running. I smiled when I smelled the wonderful aroma being given off by a modern bread-making machine working away in the corner of the store. Who could resist a bag of corn meal, at 50 cents a pound, to make my favorite muffins when we got home! From the long, wooden loading dock you step into the cool shadowy interior of the mill and the tangey fragrance of wheat, rye, and corn. The soft, rhythmic sound you hear is the sound of water power turning the millstones. Stairs lead down to the lower level – a fascinating place full of moving things…belts, shafts, and pulleys. Water that has been diverted from the stream through the millrace, activates the turbine that turns the wheels that supply the power to the mill. The water is discharged back into the stream through the tailrace. The grain is ground between two 1,400 pound millstones. Grain drops from a hopper above the stones and flows into their center. As the grain flows, the miller uses a device called a turn-key to lower the upper runner stone towards the bed stone. As the grain is ground, the abrasive action of the stones blends the germ that contains the major portion of the nutritional value and the bran that contains the natural fiber. Because the stones turn slowly, nutrients are not damaged by heat. The stones don’t actually touch each other because that would damage them. Instead, the turning causes the wheat berries to move between the millstones towards the outside edge. The wheat is ground in about three to four revolutions. The flour exits into a channel that runs along the outside edges of the stones. The result is a truly natural product, not devalued in any way. This labor-intensive process is what caused the stone-based milling industry to eventually disappear. The old mills lost the race against the newly invented rollermill. On a good day [a millstone operation] can grind about 300 pounds of grain per hour [just three sacks of flour] – a small amount compared with the output of a contemporary rollermill. But the modern rollermills, by removing the bran and germ, also remove most of the nutrients. The modern process reduces the 24 vitamins and minerals in the wheat berry to only the nutrients that are required by law. Bailey, Brian. “In Shakespeare Country.” Realm September/October 1995: 58. Thomas, Dan. Personal Interview. July 11, 2002. Page, Robin. “Bread of Heaven.” Realm. September/October 1995: 72. Pine Township Historical Committee. Township of Pine 1796-1996: Two Hundred Years of Community Pride. Pittsburgh: First Impression Printing Co., 1996. It seems to me that we had written each other several years ago. I worked at the miller at Peirce Mill in Rock Creek Park, Washington, D.C. for 11 years from 1984-1995. It seems to me that there may have been some connection with your Pearce Mill and the mill built by Isaac Pearce in 1820. He was born in the Peirce House on what is today Longwood Gardens, in Kenneth Square. His twin brothers Samuel and Joshua Pearce began Pearce Park in 1780, which became Pierce Park, and in 1906 it became Longwood Gardens. One of my former volunteers started a Friends of Peirce Mill group, and they have been restoring the mill for a third time. Do you have a better image of the Pearce Milling Company. Have you seen the postcard of the ruins of the mill that is often found on eBay? I have a nice color print of Hazen’s Mill that was once located on the Conoquenessing Creek in Franklin Township, Beaver County, Pennsylvania. Good to hear from you again. I answered some of your questions via direct e-mail, but I do want to get down to see the restored mill. Aside from living near “the oldest, continuously owned, family mill in the U.S. (1832),” Thomas Feed Mill, we are proud of several other restored and working mills nearby: Latrobe mill just behind St. Vincent College, Rt. 30, and Freeport mill along the Allegheny River, Rt. 356. When you come up to Somerset County to see the new $10 million Flight 93 Memorial, we’ll take a tour. Are you giving tours of Rock Creek?